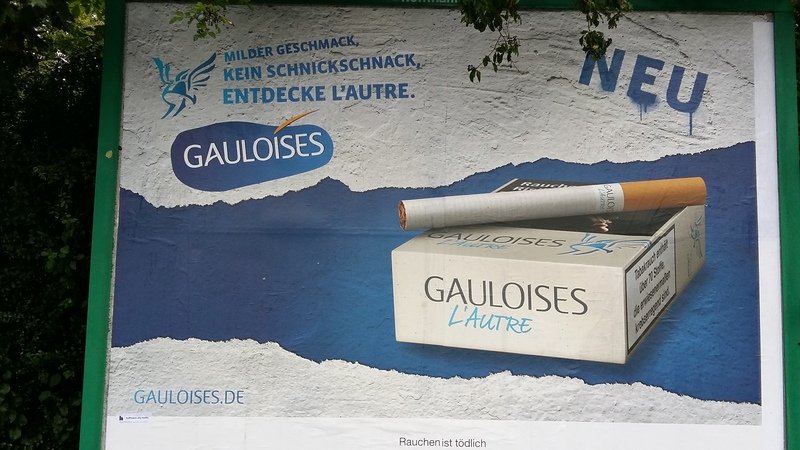 As discussed for other brands, blue is the new black in the German cigarette advertising world. Gauloises is the latest bra nd to go blue, uninspiringly so (left). Milder taste. Kein Schnickschnack – I’d buy it for that alone (no “bells and whistles” is a possible translation). I suppose the real whistle is “Krebs” – cancer to me and you. This yea r’s summer holiday has been walk oriented. The semi-planned tandem tour was sidelined. We did take a ride to Tutzing on Starnberger See, however. 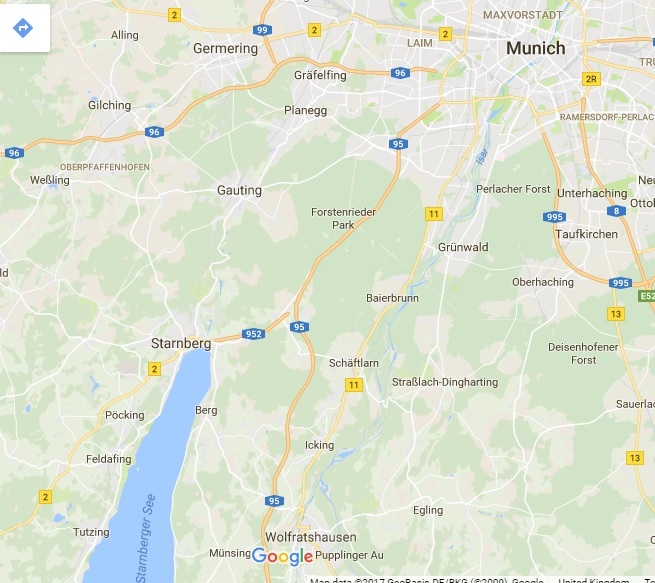 The original thought was to ride to Starnberg (24kms) and then ride around the lake in a clockwise direction and pick up the train at Tutzing. 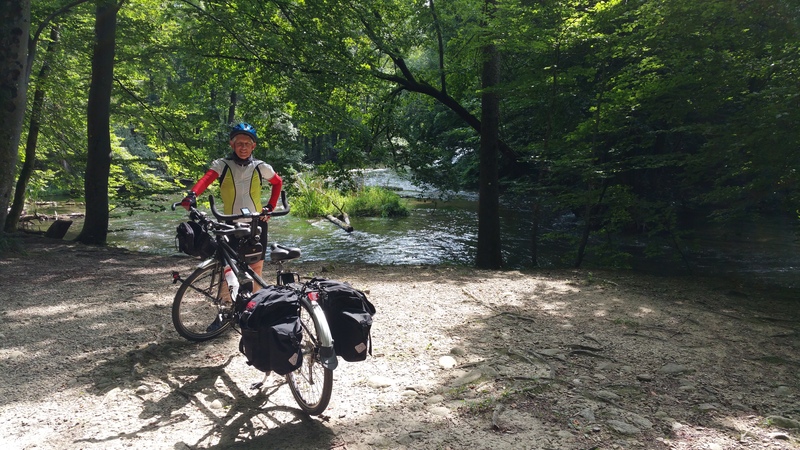 We started out in fabulous weather along the Würm Tal (Würm Valley). There is a cycle route taking in Planegg, Krailling and Gauting. It is lovely, though there are plenty of walkers as well. Care is needed. 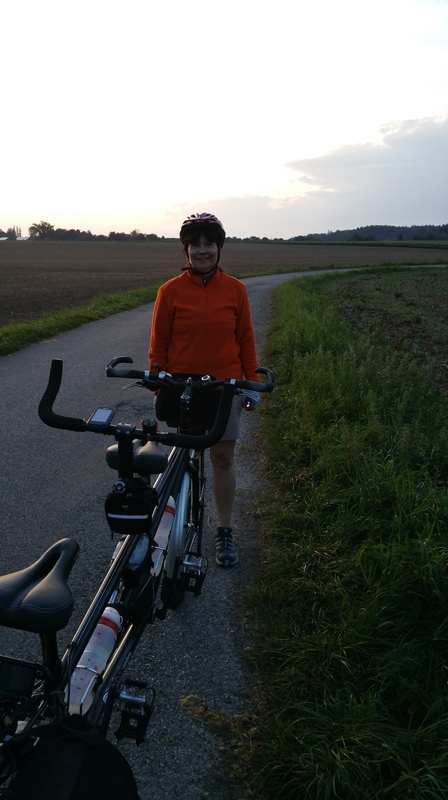 From Gauting to Starnberg we found the Mühltal cycle path which we had never used before. Wonderfully forested (right). We picnicked there. The path joins the main road into Starnberg, but there remains a cycle track. The weather caught up with us. We decided to cycle anti-clockwise straight to Tutzing. The path is again forested with lots of people hiking and bathing. It is frequently necessary to leave the lake to go around private property. The rain came down in Tutzing. We elected to go to a Greek Taverna to eat. And then at 1840 we elected to cycle back to Munich rather than take the train. The rain had passed, but we would need to do part of the journey in the dark. We retraced our route back to Starnberg and then took an alternative route signposted to Königswiesen. 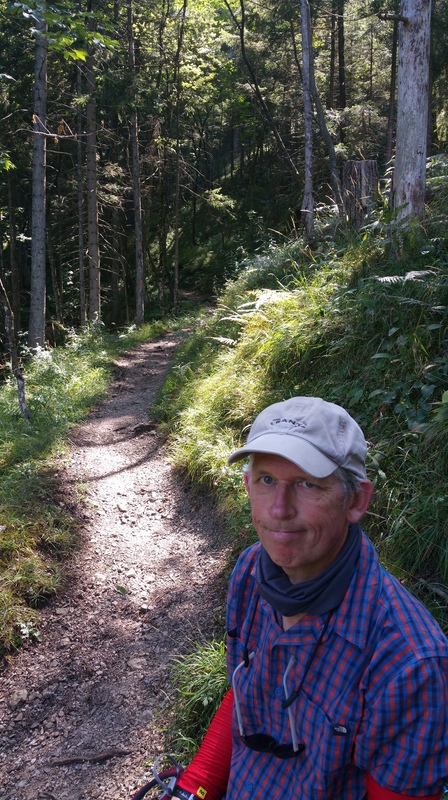 We climbed out of Starnberg and through a golf course into another forest. When we emerged we were close to Hausen (right). Stupidly we went through the village rather than turning right towards Königswiesen. If there was a signpost, we missed it. This resulted in a bit of detour to get back to Gauting. 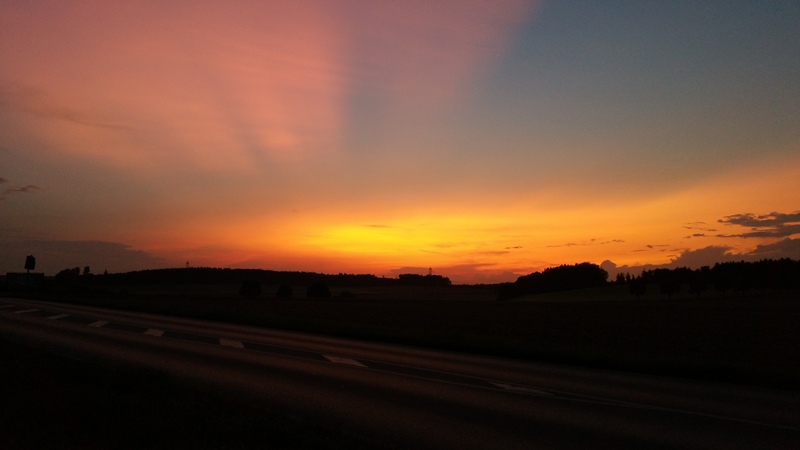 Lovely sunset, though (left). Once in Gauting, the route to Munich is fully illuminated and with dedicated cycle paths and good signage. 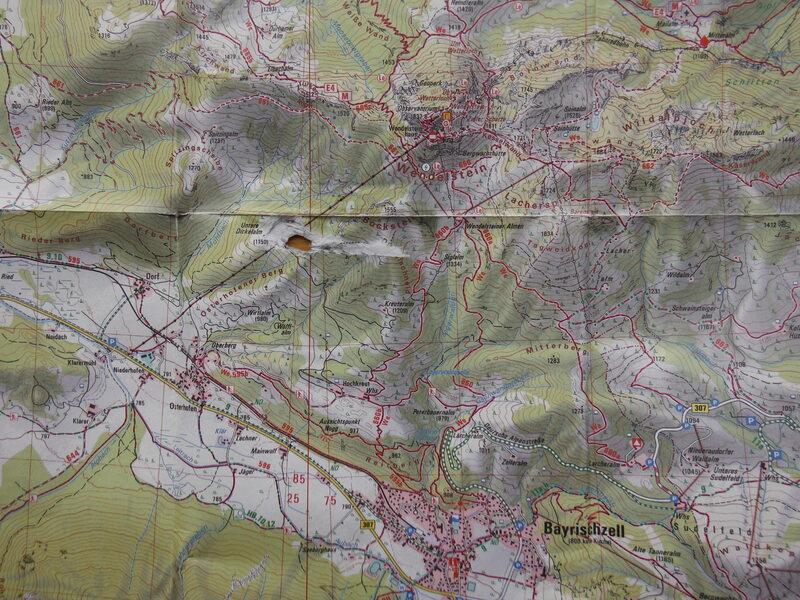 In total, we managed 87km. We were pleased with ourselves. 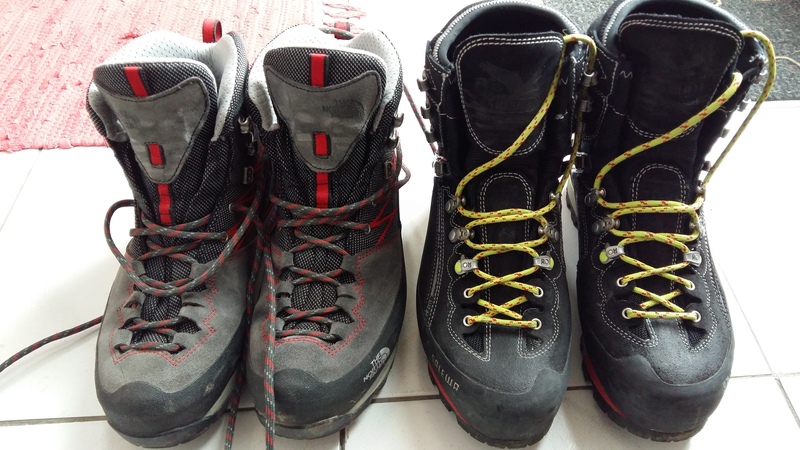 Equipment – mountain boots for sure. The ground is challenging and ankles need support. I have worn successfully my North Face boots. Comfortable, sturdy, quite rigid. 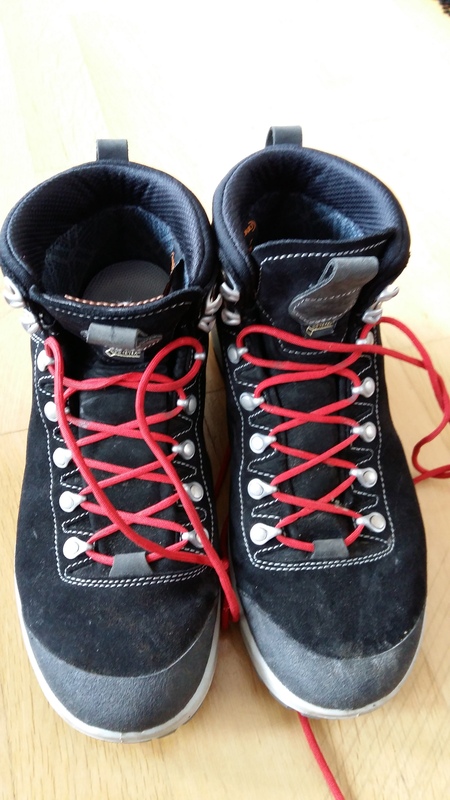 My partner used a pair of AKU CF Custom Fit boots (right). They are Gore-Tex lined and have a Michelin sole. They are unusual in that they are actually made in Italy. Combine with walking sticks for stability. The weather can change very quickly; so, the usual advice is, be prepared. Take layers and make sure you have some waterproof clothes. Weather forecasting in Germany is different than in the UK. The British are obsessed with weather forecasts and can anticipate three new forecasts per day to be broadcast on TV and radio. The Germans seem satisfied with one. We have relied on ZDF. Non-German speakers can get the gist from this forecast. More importantly for making decisions about where to go and how long to walk are the weather radars available on the internet. These have helped us to make decisions even when we have been on the train heading out. If rain is forecast, these radar charts give a pretty good indication of exactly when it will arrive or whether it will stop. 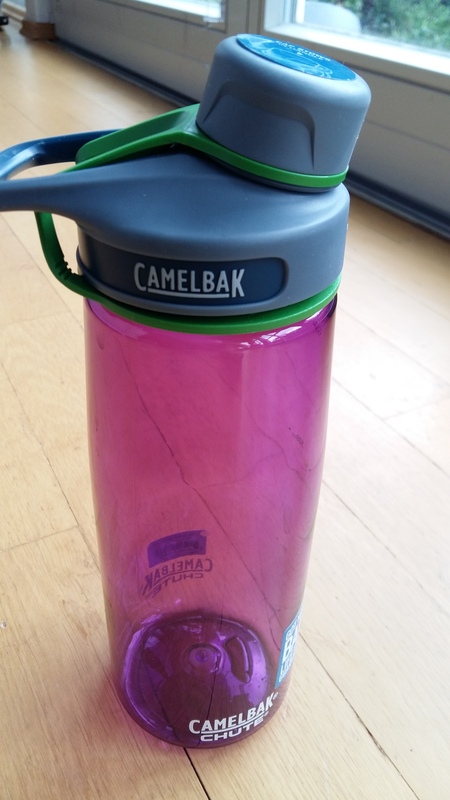 Water – we are using Camelbak Chute bottles (left). They are 750ml capacity and watertight. I loathe bottles that leak. We have four of these. 3l gets us through a day of 6-8 hours with afternoon temperatures between 25 and 32 degrees. 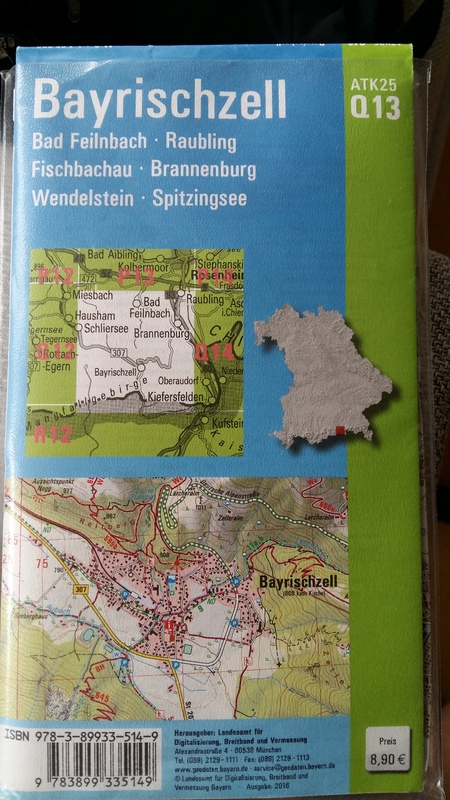 Maps/guides – we started off using the Hikeline Wanderführer (authored by Katharina Spannraft) as our guide, but then bought a map (right) to give us a bit more flexibility and a better idea of alternatives. Paths are numbered and relate to the footpath signs on the route. Easy. Food – we made our own sandwiches. However, there are Alm houses on most routes where food is often available. We did well when we visited; but they do close usually by 1700. 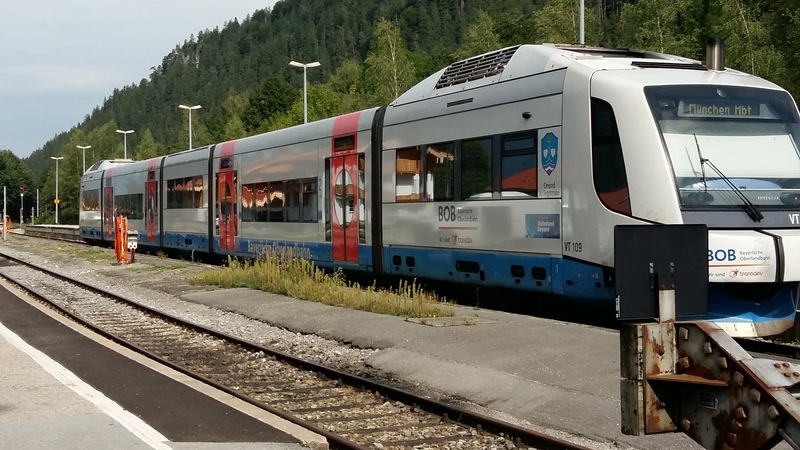 Transport – exclusively using Bayrische Oberlandbahn from Munich (left). There are three destinations, each with their own walking options – Bayrischzell, Lenggries and Tegernsee. A Bayern off-peak (after 0900) day ticket was €31 for the two of us. Cheaper than buying single tickets. We start ed at Bayrischzell. The walk started at a car park and mini-golf course to the south of the town. Route 645 is a delight. Initially wooded and constantly zig-zaging as it scales the steep side of the mountain. 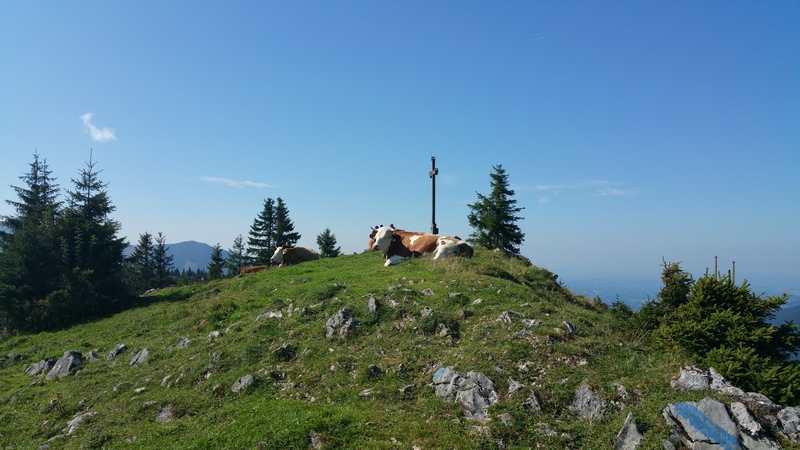 When hikers have had enough of views over Bayrischzell and towards Wendelstein, walkers go back to the Alm a nd either retrace steps back to Bayrischzell or go right following a path to Osterhofen. It is a steep descent. The path meets a driveable path signposted to Klareralm and further to Niederhoferalm (below right). The best of the walk is still to come, however. Follow route 645a (Talweg) towards Bayrischzell. The valley is fantastic and vertigo-inducing in places. Eventually the path meets the road, though continues in parallel at a discreet distance. We rewarded ourselves with dinner at the Alpenrose Hotel restaurant (eating on a very pleasant terrace). Vegetarian food available in that very Bayern way. 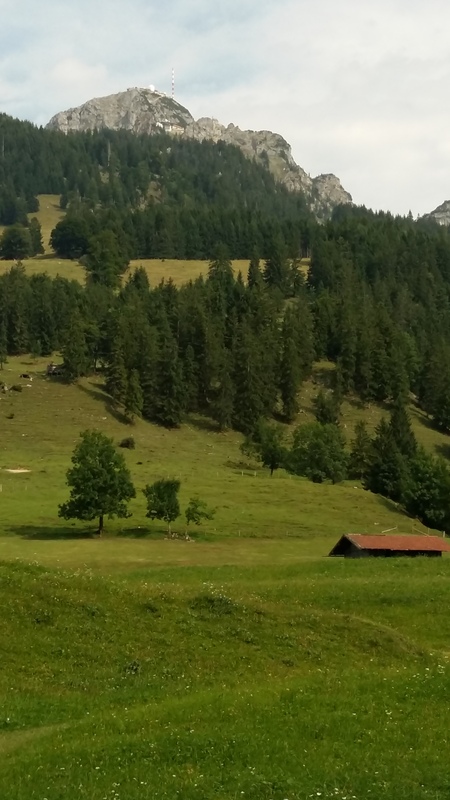 Wendelstein is an imposing sub-2000m mountain in southern Bavaria. It is accessible on foot by 7 paths. There is also a cable car (Seilbahn) starting at Osterhofen (near Bayrischhzell) and a mountain railway originating at Brannenberg. 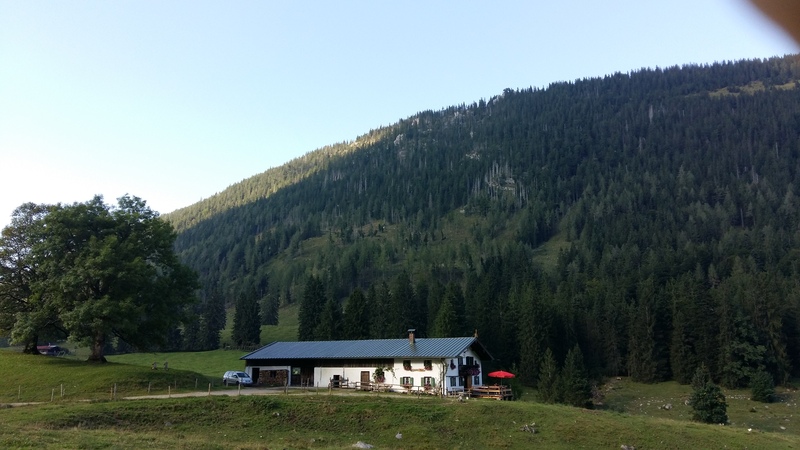 We took route 660b from Bayrischzell, first through some forest before the mountain is visible just short of Hockreut Alm (right). 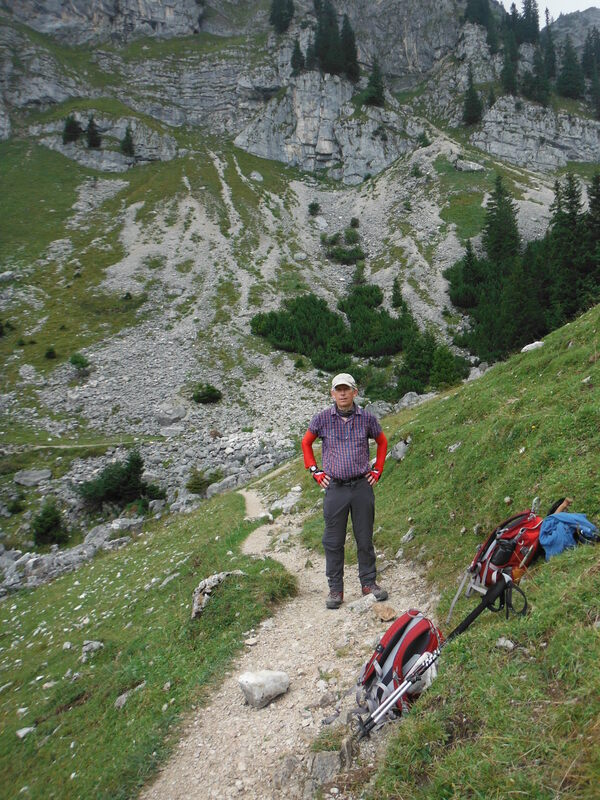 Overall, it is only 6km, but it is very steep in places. That said, there are many children to be found scurrying up with ease and, indeed, enthusiasm. 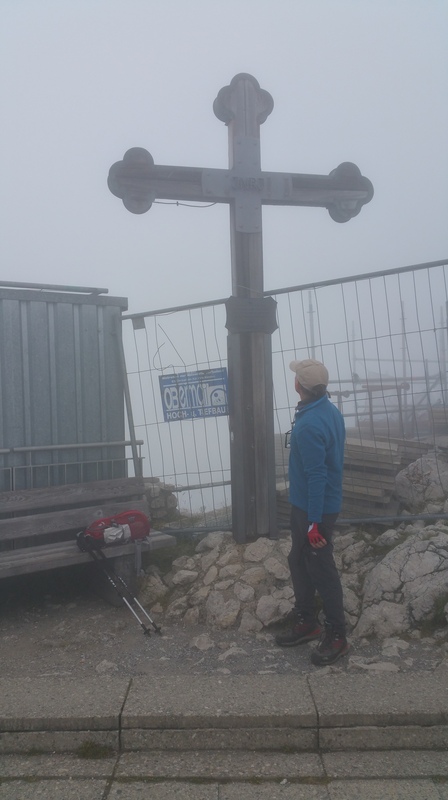 It took us a textbook 3 hours to reach the summit (the final section is a constructed path leading to a viewing platform) in increasingly deteriorating weather. Clouds were beginning to envelop the peak – with an attendant temperature fall. It is well way marked, maintained and engineered. In some of the most difficult parts, robust wooden steps have been provided. They are helpful and make the whole experience safer. There is plenty of exposed rock which will be slippery in rain. At the top one finds a viewing platform (currently being rebuilt) and a cross (right). There is a television mast and a university observatory. There is also a cafe/restaurant. Expect a lot of people at the top. Savour the climb rather than the summit. 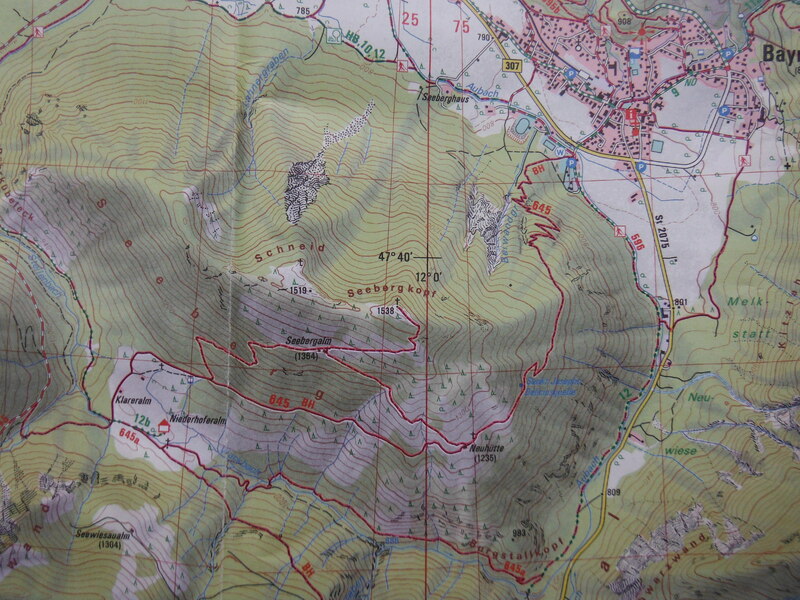 That said, there are many panels detailing the geology of the mountain, albeit only in German. We took the Seilbahn down. It is expensive, currently €14.50 per adult. We had wanted to walk back along the train route to Bannenberg; however, the ascent is probably enough of a middle-aged couple for one day. The weather was also a significant factor for us.